A Nagueño in the Blogosphere: Say that again? AFTER that most unexpected editorial slamming Camarines Sur Gov. LRay Villafuerte, my favorite Bicol Mail editorial writer is back, he whose life revolves around City Hall, in particular Mayor Jesse Robredo. Which gave me an idea: to inject some life into this blog (which is supposedly part of the so-called new media), why don't I dissect the rantings of the venerable Bicol Mail's resident angry old man and expose him for what he is? So for this week, what a fitting way to start than with -- tadaaah! -- the city public schools. THE TRANSFER of City Division of Schools Superintendent Evangeline Palencia to the City of Ligao is unkind and cruel to both -- to her and to the City of Ligao. She was blamed for the poor showing of Naga City public school students in the National Achievement Test. These students from Naga City did not come up to the expectation of the city officials who would refer time and again with pride to the ratings attained by students who had taken the examination last year. Hello! My favorite editorial writer is clearly shooting from the hip. 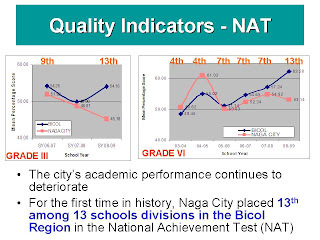 Naga's elementary schools last exceeded expectations in the 2005 National Achievement Test (NAT), when Dr. Nenita Ramos was still superintendent. Since then, their performance has been deteriorating. In any which way the city officials explained the transfer -- that it was routine, that it was the decision of the higher-ups in the Department of Education, that the transfer may be done at any time of the year which is reportedly beyond the control and not of the making of the city officials, and that it cannot but be associated with the poor showing of the examinees about which the city officials felt dismayed. He's making things up again. Let me make it clear: the city government actively sought Dr. Palencia's transfer, as early as November 2008 after news of shenanigans at DepEd-Naga first surfaced, arising mainly from COA's 2007 Audit Report. That report cited 10 negative findings, including (1) Non-adherence with existing auditing/accounting laws, rules and regulations to prevent irregular, unnecessary and excessive expenditures resulting to wastage of government funds amounting to P1,811,340.72; and (2) Payment of P264,395.00 for job contracts, cash advances, reimbursements for travel expenses and other expenditures of four relatives of the OIC-SDS, in violation of pertinent provisions of Republic Acts No. 6713 (“Code of Conduct and Ethical Standards for Public Officials and Employees”) and 3019 (“Anti-Graft and Corrupt Practices Act”). When that COA report came out, the relationship between City Hall and DepEd-Naga was never the same again. Last year the performance of the examinees was highly commended because Naga City was ranked among those in the top, very much reflective of the excellence that city officials would like Naga City to be reputed in any endeavor. Excuse me? Since when did a 7th-place performance (out of 13 divisions in Bicol) become "highly commended"? This year the examinees were ranked 187th among the 204 divisions in the national and 13th, the last in the heap, in the regional level. Ahhh! At last! My favorite editorial writer finally got one paragraph right. If Superintendent Palencia were the one responsible for the poor ratings of the public school students this year, then the City Division of Schools of Ligao City should feel insulted by the appointment of Palencia in the division. Ligao would not like to be the recipient of a loser, to be a dumping ground of an ineffective superintendent to head the division in the training of their children. Let me tell you: they are. I was there last week. The acceptance without any reservation of the City Division of Schools of Ligao City for Superintendent Palencia flings down the gauntlet on the unkind imputation directed at her by the City officials of Naga. It was outgoing Supt. Dads San Antonio (who was promoted to the DepEd Central Office) who joined Mayor Linda Gonzales in showing us around. Enough said. If Superintendent Palencia were the one responsible for the poor ratings of the public school students in Naga City this year, then how come the buck should stop with Superintendent Palencia. There are officials who have been dipping their hands in the education of public school students in Naga. They should equally be made answerable for the poor ratings of these students. That is called "command responsibility," and I agree that there are others who should be made answerable as well, particularly the school heads who are not doing their job. An off-year is understandable, but three consecutive years is certainly not acceptable. No amount of funds released for the public school children in Naga by the Local Government of Naga -- for their school bags which contain the names of City Hall officials, for scholarships that are given by reason of political patronage -- can assure quality education. True, without a superintendent leading by example and competent school heads doing the same, the city government is only throwing good money after bad. Palencia's tenure is Exhibit "A" and the Bicol Mail is faulting us for exacting accountability. School children are not equally gifted. Some batches are not as good as others. No matter how insistent teachers are in their classroom instruction, if the students are not intellectually endowed, there is no room for excellent ratings in examinations. Probably, especially if it is a one-off thing. But four consecutive failing years, the last two with Palencia at the helm? Considering that these students had the same teachers as the students who had taken the assessment test last year, there is no doubt that they were given an equally strenuous classroom review if only to prepare them for the assessment test. Laying the blame on Superintendent Palencia when she has no direct hand in the results of the assessment test is truly unfounded to say the least -- cruel and unkind to say the most. As superintendent, she is primarily responsible for the performance of the DepEd-Naga Division and therefore accountable for its education outcomes, including the NAT results. The city officials who blamed Superintendent Palencia for the poor ratings of the public school examinees should look at themselves and lay the blame on themselves too. After all, they are in the same boat as the Superintendent. If Superintendent Palencia was blamed for the poor ratings of these students because she was their City Division chief, City officials should equally be blamed since they have command responsibility for the education of these public school children. These officials use to bruit about in their pagsalingnoy that their program called QUEEN is one that assures quality education, and that under their leadership the number of public schools has increased through the years. We fully subscribe to the principle that "education is a shared responsibility" in spite of the fact that public education is not a devolved function and therefore not within the control and supervision of the local government. (The mayor, for one, cannot hire and fire the superintendent.) Others could have invoked that argument and get away with it. But not us. As early as December 2007, with Palencia having already warmed her seat at DepEd-Naga, I warned the city's school heads and supervisory staff about the danger signs. Their response was a division planning conference at Regent Hotel that I attended as an observer; one thing that stood out from the individual plans presented, which I pointedly underscored when asked for comments, was the absence of clear numerical targets for each intervention. They never invited me again. 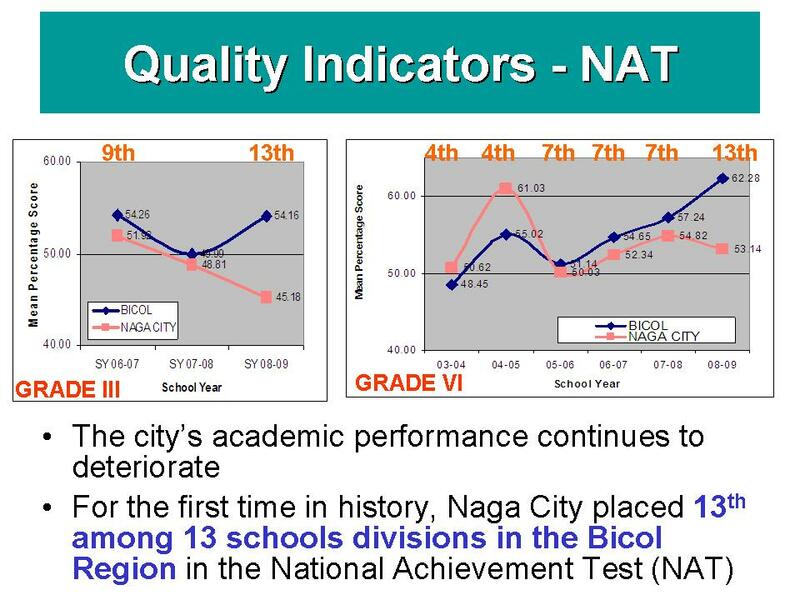 In October 2008, when Mayor Robredo presented his second State of the Children Report at the Naga Youth Center, with Palencia and the new assistant superintendent Carlito Boni in attendance, the same concern was raised with greater urgency: Naga's performance has been slipping. And this inconsistent performance does not match continuing investments of the City Government. Both chose to skip this year's report that highlights the celebration of Children's Month every October. Which is why at the very outset, when the 2007 COA report surfaced confirming our worst fears about Palencia's leadership, Mayor Robredo immediately sought her replacement. The city's public school system deserves a better leader. And it took the DepEd Central Office one full year to realize this. Money released for salaries of teachers in the public schools in Naga City, even the establishment of a School Board or the enactment of an ordinance establishing the QUEEN will amount to nothing, if education is treated as a business enterprise and as a political item. Correct premise, wrong conclusion. All these will amount to nothing if the Nagueno child cannot be assured of two things, and only two: access, that he has every opportunity to graduate when he enters Grade I and First Year; and quality, that what he is getting is the best that his city has to offer. All others are mere propaganda. Many of those who had unkind words for Superintendent Palencia do not even know how to run an educational institution and how to teach a class of 60 students, with not enough room space and not enough books, students who report to school with empty stomachs and with parents who avail of any of their free time for home and livelihood chores. I should know: all my school-age children are enrolled in the public schools of Naga, two of them in an elementary school that we share with the less well-off residents of the city. Which is why I am mad because they deserve far better than the rut that our public schools are in. Government officials who are accustomed to be conferred with awards of excellence cannot claim that they have the right to treat unkindly anyone who falls short of it. We are not claiming it now or in the future because that imagined right is definitely home, safe and sound, with Bicol Mail's angry old man. But we reserve the right to demand better public schools -- including better superintendents, school heads and teachers -- and better newspapers -- including better and more well rounded editorial writers whose lives do not revolve around City Hall, and for that matter Mayor Robredo, alone.